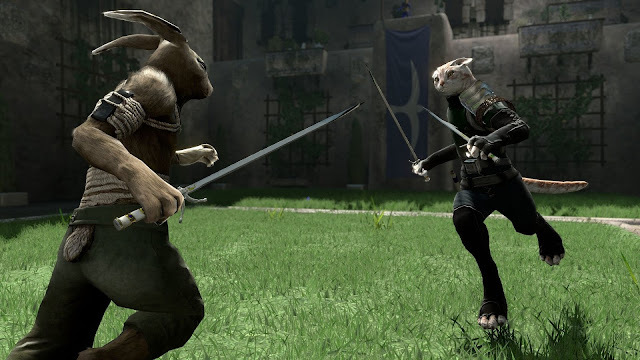 Overgrowth, a combat platformer developed by Wolfire Games, has been in the pipeline for a long time coming. It began as a sequel to a shareware game – Lugaru – and saw a slow but consistent schedule of patches until its final release. The extended development time and constant incorporation of community feedback has led to a game which feels wholly well thought out. I can easily justify the purpose of every mechanic, every level and every design choice, and the developer has craftily used each component to give the best gameplay experience at every turn. 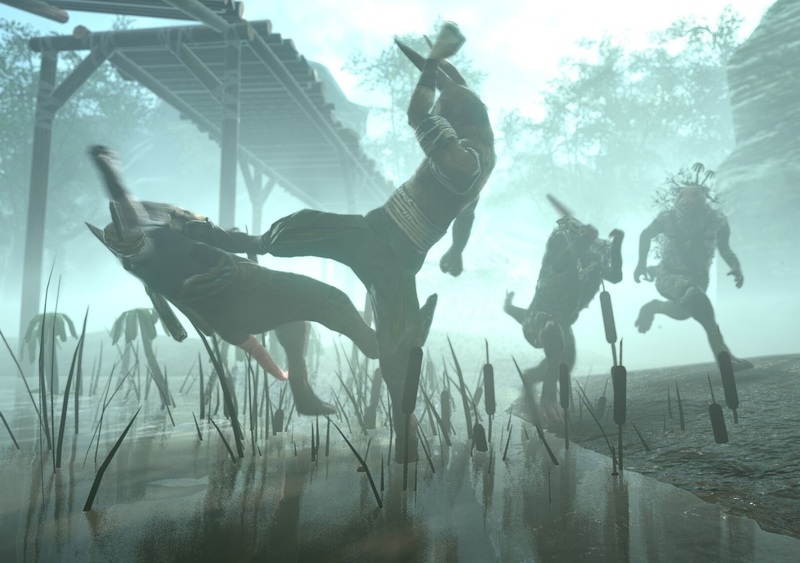 At its core, Overgrowth is a combat game. Players take the role of Turner, a martial arts practicing rabbit, and guide him on his rampage killing other rabbits, dogs, cats, wolves and other animals alike. Combat is simple, quick and brutal – the left mouse button is a contextual attack, and the right mouse button timed correctly executes a counter or a stealthy kill move. There are no health bars or even a HUD here: kills are registered by how much sheer damage a character takes whether it be a forceful kick, a weighty fall or a strike from a weapon. Swords, knives, spears and other weapons are scattered sparingly across each level and quickly become the meta of Overgrowth – most levels will be about finding which enemies carry weapons, dispatching them first and then leveraging the weapon to pick off other animals until everyone except you is dead. There is also a hefty mix of platforming elements to keep things interesting. Turner has a huge, flighty jump befitting a rabbit, and the wide rollicking hills and towering structures in each level are very conducive to the bounding movement options available to the player. This allows Wolfire games to work in parkour sections into some levels, but also create more interesting combat scenarios. For example, attacking in midair executes a jump kick which knocks down an enemy and sends Turner flying in the opposite direction – it’s a punchy “give me some space” move which encourages players to make the most of their surroundings. Each level boils down to a combat scenario bookended by brief cutscenes, and the game isn’t afraid to make you try a couple of times until you get it right. Within these systems, I certainly didn’t expect to find was a cleverly written and detailed story about political intrigue, power struggles and social inequality. 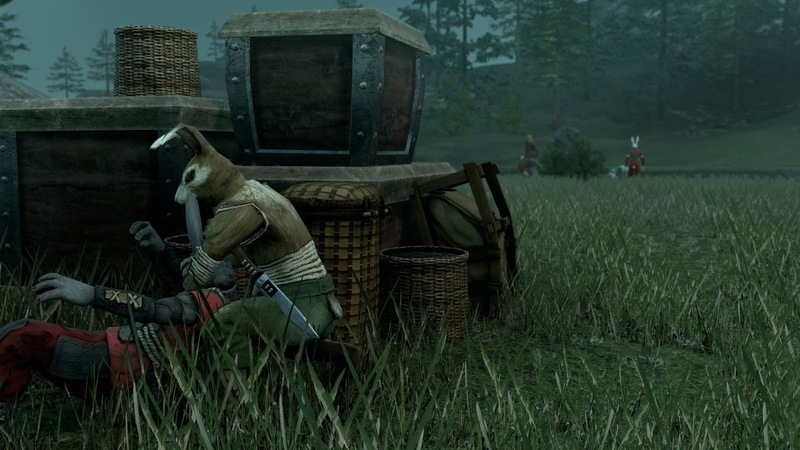 Even that sentence itself feels a little absurd to write – but trust me, Overgrowth’s story is great. It’s especially interested in making the player feel the consequences of being Turner, a character whose only meaningful way of interacting with his environment is indiscriminately murdering things. Because of his heightened combat prowess and lack of remorse, Turner is an agent who can impact the world of Overgrowth in a way none of the other characters seem to be able to do, but with this responsibility comes the grim reality of how much pain he causes. Wolfire Games shies away from the easy path of making their game a power fantasy, and instead explores the various ramifications of the violence the player perpetrates. The game’s world is an amoral one, where seeking one’s personal survival oftentimes requires violence. What I love about Overgrowth is that its narrative and gameplay components complement each other very well. Fighting is quick and brutal, broken up into ludic chunks of sneaking/strategising and brawling/running, shifting the pace from methodical to frantic at the drop of a hair. This reflects the unpredictability of the story, in which conflicts arise rapidly and without forewarning, but also creates moments of intense organic storytelling – stories of Turner the hunter/tracker using terrain to his advantage to get the edge on a powerful enemy. At the end of every level, the game pauses a bit in quietness to force the player to survey what they’ve done. There’s something meaningful which is lost if players skip the cutscenes, or if they ignore the combat segments and treat the game as a visual novel. There’s a definite wholeness to the package which is immensely satisfying. 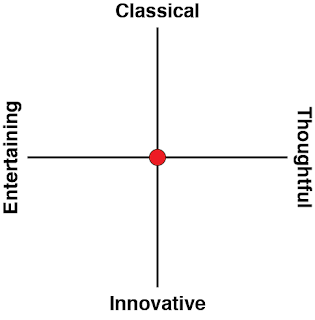 There’s also a distinctive indie charm which I can’t perfectly explain, but certainly helped my enjoyment of the game. The developers clearly love movement very much – the fluidity of the running and jumping is reminiscent of mod parkour maps on old FPS games, and the textures are kept adequately lo-fi to match. The graphics bear a sharp yet unrefined edge too: the levels tend to juxtapose organic rolling hills with sharp geometric squares and blocks to guide the player in the right direction. The lack of HUD also draws the player’s attention to the game’s world, and goes the extra mile in building immersion. I can think of many positive comparisons – the combat’s rapid pace is reminiscent of Hotline Miami, while the narrative made me recall the tense scenes from Shelter and The Banner Saga. 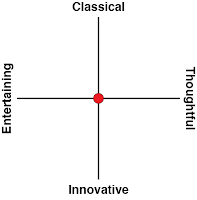 We’ve had the innovative/classical and entertaining/thoughtful matrix below our reviews for a good while now, but Overgrowth is the first game I’ve played which I think would fall squarely in the middle. It’s built upon satisfying kinaesthetic gameplay loops that create a tense and exciting combat system, but it uses every combat encounter to add to a confrontational story about the tragedy of violence. It’s an experience which I can’t adequately compare to anything else on the market, and yet it’s so grounded in mod-development culture that its graphics, controls and gameplay feel comforting and familiar. It’s a triumph of valuable development keystones which support each other, making it a game far greater than the sum of its parts – I certainly couldn’t put it down, and so I can’t recommend it enough.